in over St st, blocked and relaxed. 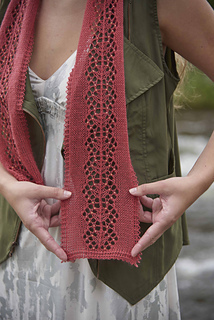 Gauge is not critical to this project, though the size of your scarf and amount of yarn used may be different from the pattern. Breakneck Ridge is a 2.8-mile (4.5 km) hike in Hudson Highlands state Park, New York. Although it is not a long hike, it requires both your hands and feet to get to the top. some sections require just a little rock climbing; wear decent hiking shoes. the vistas are totally worth the effort. there are amazing views all along the climb, many across the Hudson River, including a view to storm King Mountain. Climb early in the morning and enjoy a picnic breakfast while you watch the hawks soar. sit and knit a little. 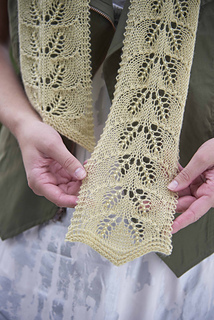 these scarves use repeating lace motifs to illustrate how beads can be used for differing effects in your lace knitting. they are great for practicing adding beads and working basic lace techniques, along with gaining comfort using charts. Feel free to use one type of bead, or try as many as you like and call it a bead sampler! 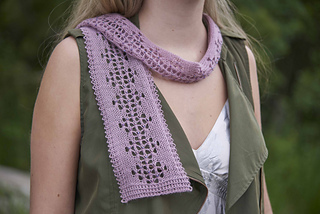 use the Beaded swatch charts for more diminutive versions of these scarves. This pattern includes directions for 3 unique scarves.